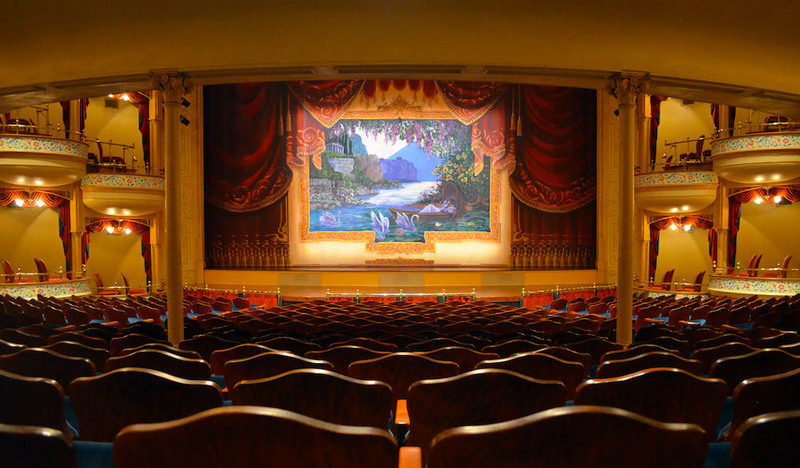 Find your seat and enjoy a show only a few blocks away from The Strand at the historic Grand 1894 Opera House in Galveston. A quick stroll from the tallships and restaurants lining the port of Galveston, the Grand 1894 Opera House stands in all of its Romanesque glory, composed of red brick, green accents, and an appropriately grand limestone archway that invites the public through its doors. For over 120 years, the opera house has remained a fixture of Galveston arts and culture, delighting audiences with dance, Broadway, opera, and performances by treasured musical artists. Prior to the turn of the 20th century, the Grand Opera House was erected thanks to the efforts of Henry Greenwall raising over $100,000 from local businessmen and residents seeking to make Galveston a tourist destination. Opening as a live performance hall, the opera house was one of the first auditoriums designed using modern theories of acoustics to create a better live experience for patrons. Over the years, it would gravitate from Shakespearean works, musicals, and operas to Vaudeville performances and films as the cinema era began. Then, in the late 60’s, the former opera house would struggle to compete with other movie houses on the island, eventually closing in 1974. After only a few years of shuttered doors, volunteers and former management began an aggressive fundraising campaign to restore the opera house to its former early-century glory. With final phases of construction and renovation complete in 1986, the Grand 1894 Opera House reopened to the public, restored to its 1910’s aesthetic featuring a recreated limestone archway over the ticket office, reworked lobby areas and seating, and the return of the painted canvas curtain, courtesy of artists Earl Staley and Peter Horn. However, beating the fluctuating business climate isn’t enough to survive on Galveston island — you need to also be resilient in the face of catastrophic weather. The Grand 1894 Opera House has found its way through multiple storms throughout its existence. Facing the collapse of the roof and theater walls after the epic 1900 storm, construction workers rallied and were able to reopen the opera house within a year of the destruction. And in 2008, after Hurricane Ike swept over the island, the opera house again faced extensive flooding and wind damage. 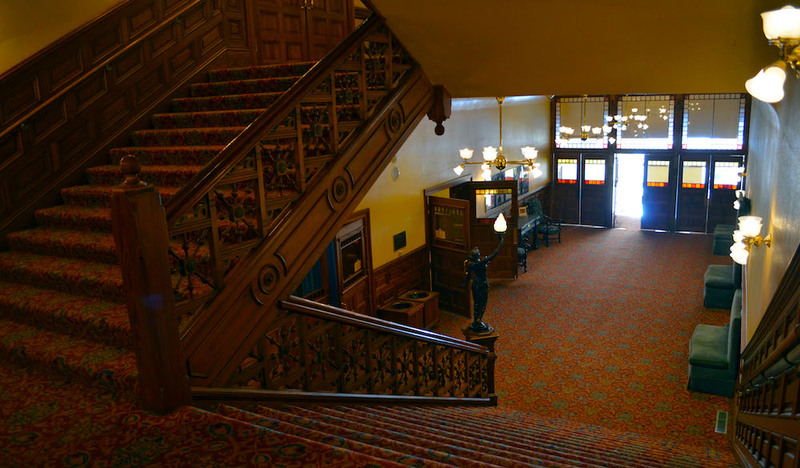 While they were able to reopen after a period of recovery, The Grand continues to fundraise for ongoing repairs and maintenance stemming from the devastation (take note of the high water mark from Ike’s flooding in the lobby). While they were able to reopen after a period of recovery, The Grand continues to fundraise for ongoing repairs and maintenance stemming from the devastation (take note of the high water mark from Ike’s flooding in the lobby). The Grand 1894 Opera House has endured much over it’s century-plus of operation. Its stage has been graced by the Marx Brothers, Willie Nelson, Lyle Lovett, Tony Bennett, and countless other musicians and productions. Today, a year-round schedule continues to feature great acts on tour, as well as special holiday performances like The Nutcracker during winter holidays. Click here to check their schedule online and book a seat in this historical opera house for a wonderful evening of entertainment. Parking around the theater can become congested on show nights so give yourself time to park and make your way in. Arriving late might mean missing your event until after the first intermission. The Grand is an accessible venue, with special accommodations for wheelchairs and hearing impaired. Call 409-765-1894 if you feel you may have a special request. Take a moment to explore the multiple levels in the lobby area, highlighted by a Mandala sand art display created by the Tibetan Monks of Garden Shartse on the top level. Parking: Lot parking is available along 21st Street, at Postoffice Street and Market Street; Metered parking is also available in the surrounding blocks. Fees are required at each parking location. Events & Admission: Click here to view a full schedule of events as well as the different price levels in seating for each.